Are you struggling to get your head around how Twitter works? And how you can get real return for your efforts? This post started because I was having trouble finding a guide online to Twitter that was current and useful for our clients – so I decided I needed to make one myself. 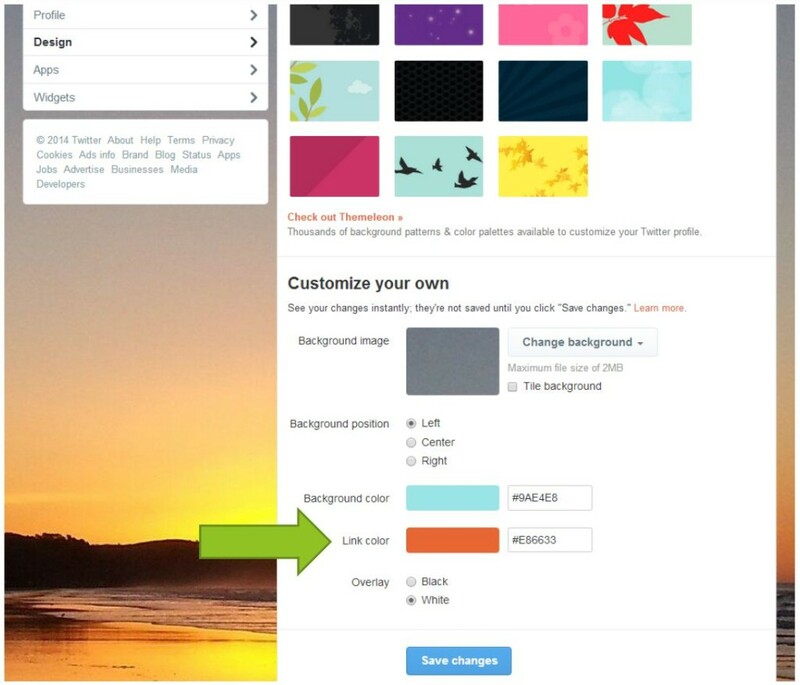 Here are a few simple steps to improve your Twitter appearance and to amplify your reach and performance. I’ll break it down into a few of what I consider to be the most important areas. Twitter is well worth the effort in learning how it all works. It looks like the simplest of the social media sites but its complexity will surprise you. Twitter brings great value in communication, access to information and in content promotion and it is an amazing platform for building relationships. 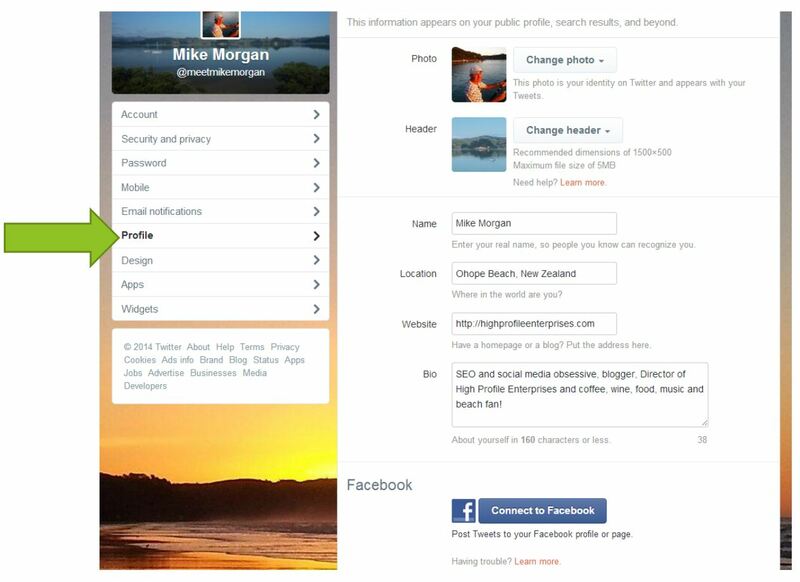 If you look at my Twitter page @meetmikemorgan you will see how I have completed the important elements that people are looking for when they visit a page. 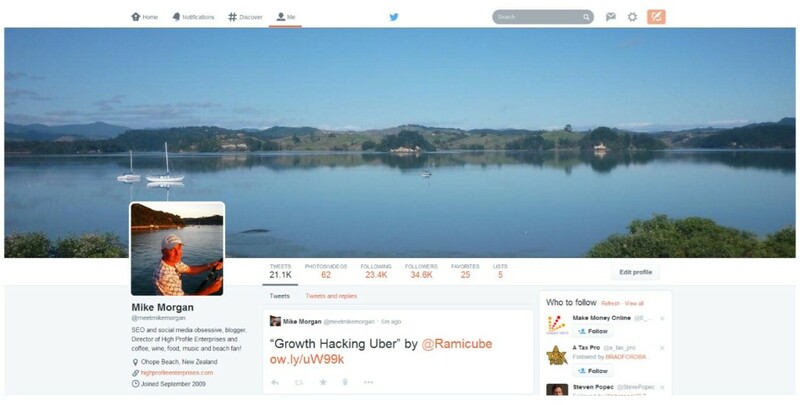 The Ohiwa Harbour scene is the Header Image. The bio image is one of me fishing – a high res shot. The bio is complete and the website link is added. Top right is a cog where you can go to settings. 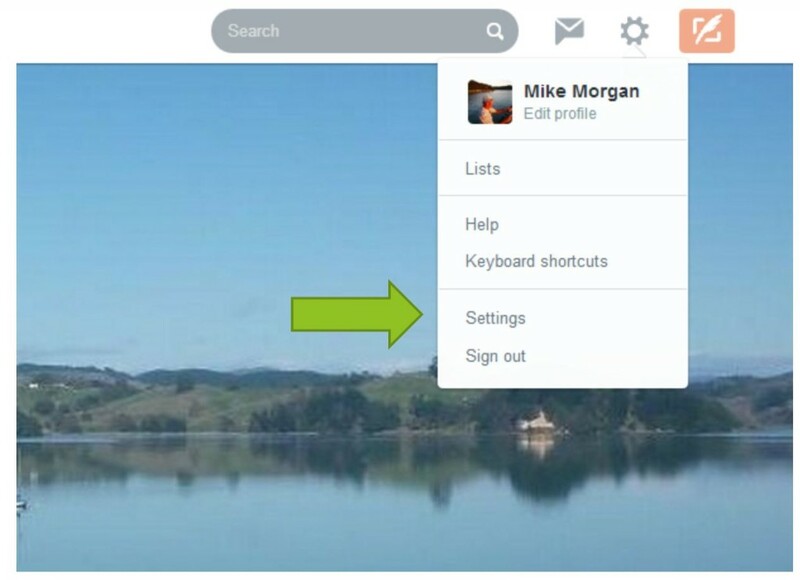 From here you can make a few changes, add images and adjust your settings. This first one is account – you should set your time zone and country here. This is also where you can change your username if you ever need to. Once you have made any changes click Save Changes at the bottom. Profile is where you get to add your photo, change your header, and you add your real name, location, website and your bio (160 characters or less). Let the bio say a bit about yourself – be a bit creative. I do not encourage you to connect to Facebook – never a good idea to automate between two different platforms. It is a good idea to customise your design to be in keeping with the colour scheme you are using for your brand and image. 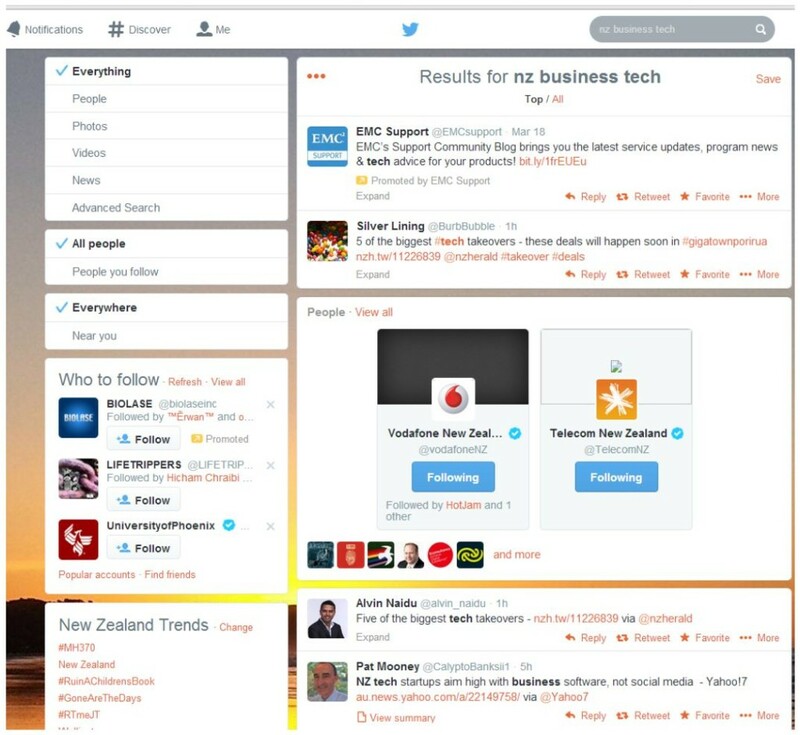 You can see that I have uploaded a Ohope sunset image as my background and have chosen a colour close to the High Profile Enterprises orange as the link colour. Don’t use a grey or black link colour as people will not know that your links are clickable. The background image should be a large high res file – ideally 2500 x 1600 px but less than 2MB so you may need to compress it a bit. Next is a step that will save you a huge amount of time. Go to Email notifications and uncheck every box. Unless you want to drown in an email flood that is. 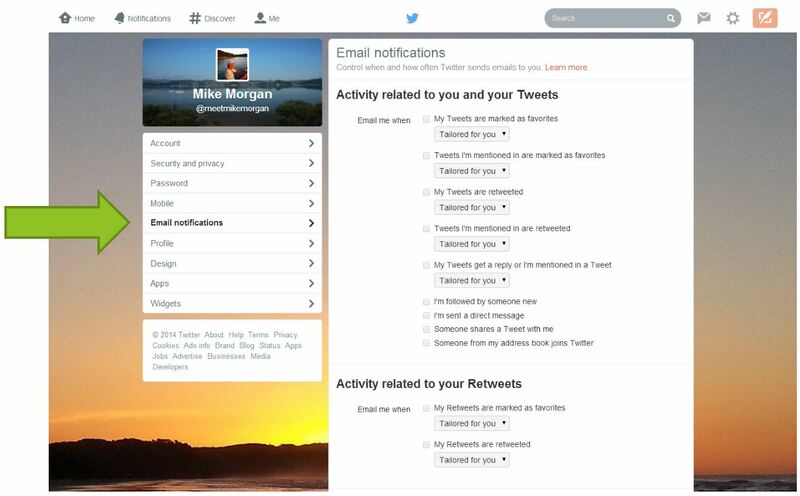 If you want one or two specific emails about Twitter news that is OK but it is better to login to see what is happening in notifications within your Twitter page than to have inbox overload. Next you might also like to download the Twitter mobile app and activate Twitter text messaging. Make sure you have unlimited texts first as this can be a shock addition to your monthly bill if you become a power user. Use a photo that is relaxed but professional – mine is very relaxed on Twitter (fishing). Make sure the photo is of you – no pets, logos, funny images. High quality – no blurry, badly lit pics. Use a background and header image that says something about you or your lifestyle. Put some thought into your bio – what would people find interesting about you? What is it you are passionate about? OK, now your profile is looking good what should you tweet and how often should you do it? Twitter is a high speed information network so you need to be fairly active. One tweet every few days will mean that you are going to get lost in the maelstrom. 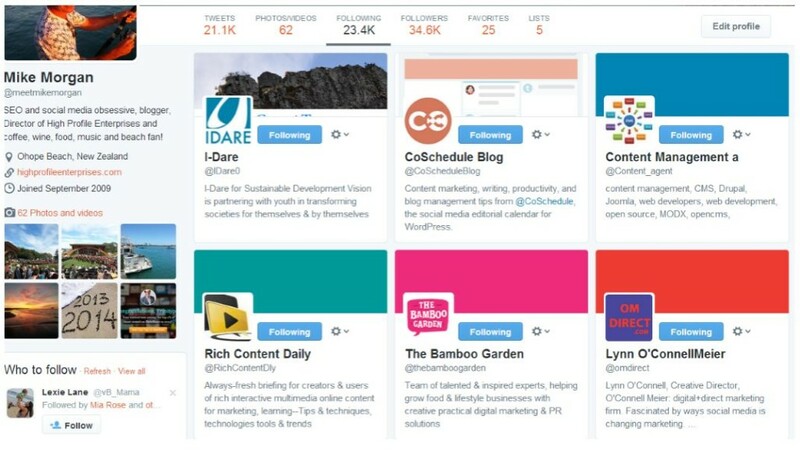 Ideally you will be tweeting a number of times each day and in the section on scheduling I will share a couple of tools that will help you to schedule content based tweets so that you do not overwhelm people who are not following many others. This is a great opportunity to establish your expertise in a particular area. What you read and share will demonstrate to people that you know your niche and will give you an element of thought leadership by association. I spend a set time every day finding, reading and approving content to add to my feed. It has to meet a high level of quality, accuracy, entertainment, topicality and ideally it should relate to what you do. 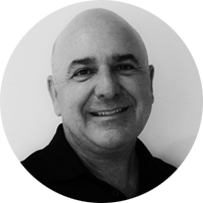 It’s also a great way to stay up with what is happening in your industry and to find out who the thought leaders are. 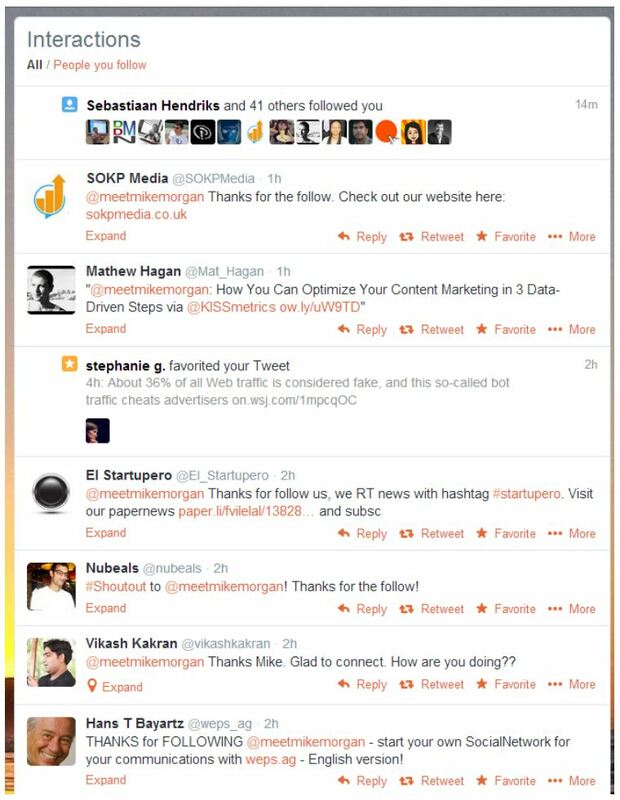 You will find tweets from me on any given day from SEO, social media, content marketing, entrepreneurism, conversion optimization, user experience, writing, design, business, marketing, advertising and a number of other related topics from good sites. Get yourself a list of the sites that are publishing content you find useful and visit them regularly to see what they are publishing that you can share with your audience. And naturally, you should be sharing any new posts from your company blog. You can share a post from your blog a couple of times on the first day of publication, then share daily for the next couple, then if you have a good number of blogs up your sleeve you can rotate archive posts and recent ones each day. If you are the type of person who is able to post witty, insightful pieces of wisdom as well as content then do so. People will share tweets that are funny or strike a chord or are seen to be smart. Do not ever take part in any of the abuse or bullying behavior that can occur on Twitter (particularly around politics). Express opinions but don’t criticize individuals. This will end up biting you. 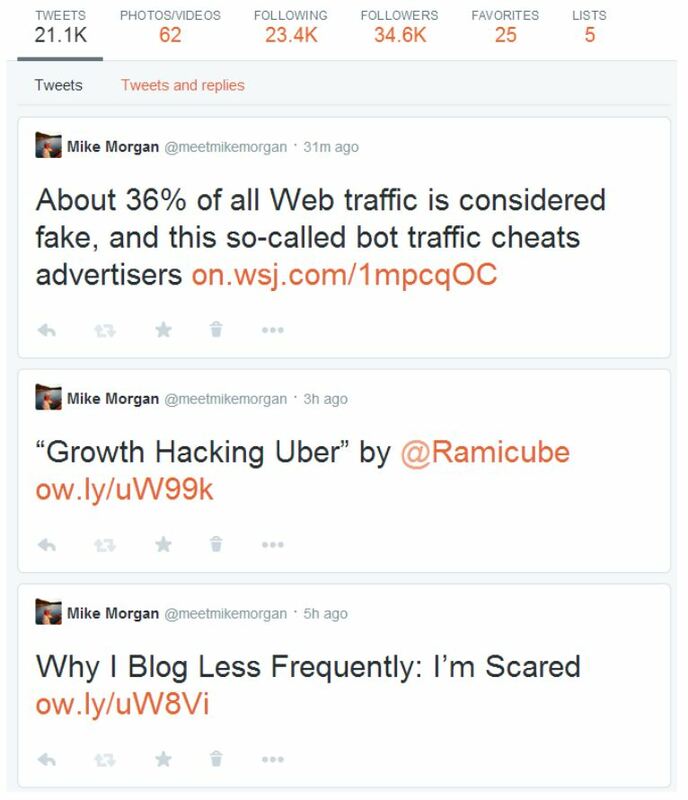 This is a snapshot of the last 3 tweets on my account – advertising, growth hacking, blogging… spaced out by a couple of hours. Twitter is all about gratitude, promoting others and responding. This is where people will engage with you. They may retweet something of yours, they might thank you for following, they might just say Hi (or they might spam you). The first row shows the people who have followed me recently – see who they are and follow them back if they are interesting (and not robots). Then SOKP media said “Hi, visit my website”… um, no thanks. Why would I – we’ve only just met? The next couple are thanking me for following so you could be polite and say “You’re welcome” if you wanted to keep things moving. Then Vikash asks how I’m doing so I would go back with a response. Some conversations will end abruptly so don’t be concerned when this happens. Each time you engage people will remember you and over time you will build a network of people that you talk to and who share your content. You will begin to see a pattern of certain people who enjoy your content and share it. It is a good idea to return the favour periodically as well – share something of theirs. Here are two services that allow you to find a few posts and schedule them in advance. 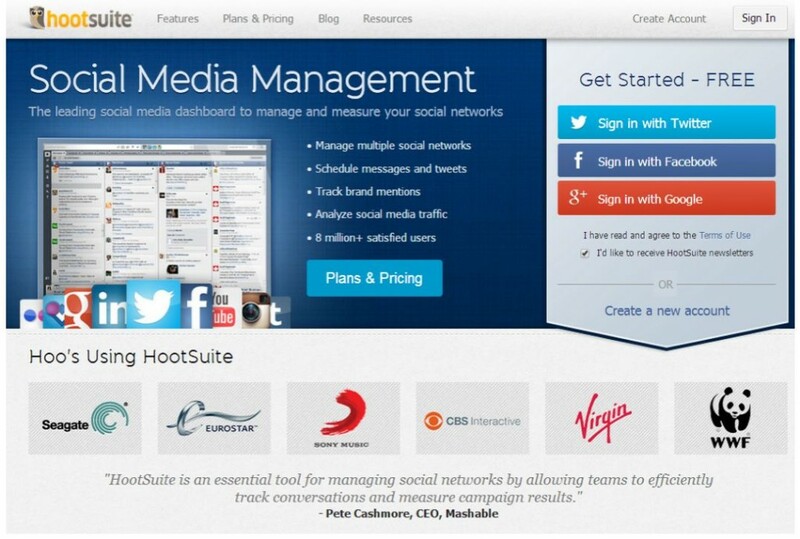 Hootsuite can be a little complex to set up but the account is free for a single account and it is a very good tool for sharing. You can use it for Twitter, Facebook, LinkedIn and Google+ among others but I tend to use it for Twitter primarily. 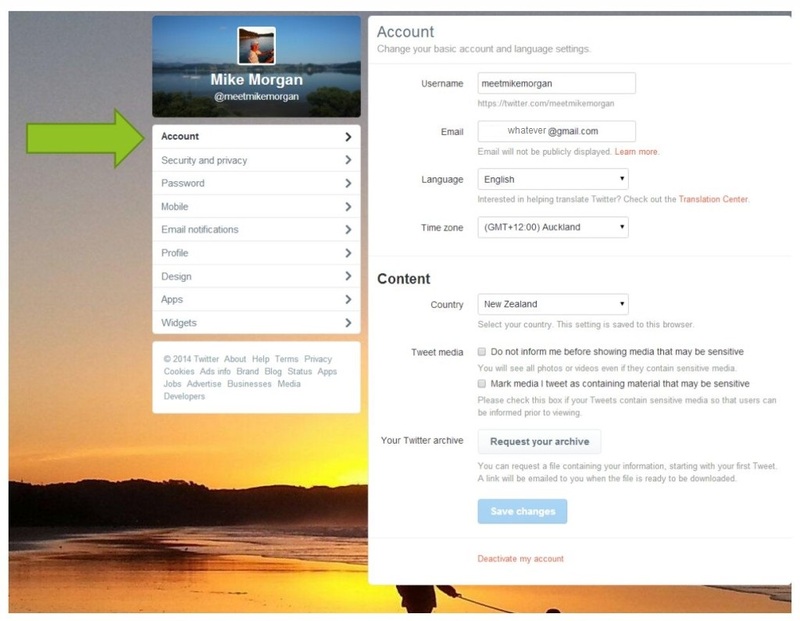 Once you have set it up it is easy to go into your Hootsuite account to pre-load tweets for days or even weeks ahead. Don’t schedule interactions though – this is purely for content. Best streams to track are Scheduled tweets, Sent tweets, Mentions and My tweets retweeted. The second useful scheduling tool which I recommend is Buffer. This one is simpler to use but has less flexibility. Again it doesn’t pay to schedule any interactions – do these live in Twitter. If you wait for people to discover you and follow you (unless you are a celebrity) you will be waiting a long time before you have a reasonable number of people following you. The answer is to get out there, find people of interest and follow them. A percentage of these people will follow you back if your profile looks interesting and if you are posting interesting content. So how do you find these interesting people? By all means follow big accounts like New York Times, or Adage, or HBR, or Ted Talks but be prepared for the fact that they will not follow you back. 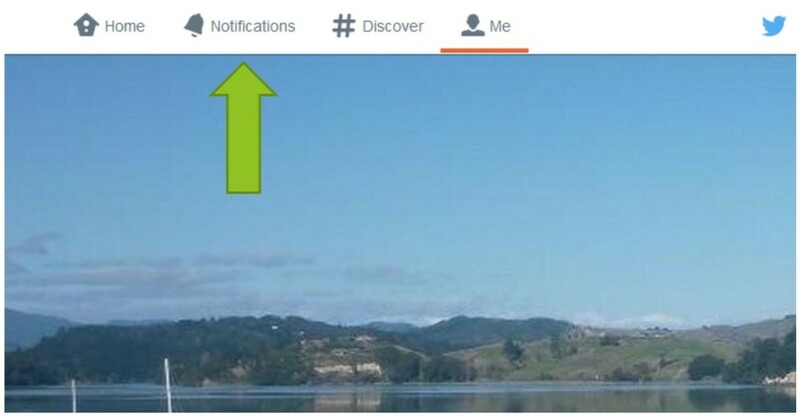 So you should look for people of interest that are going to notice that you have followed them. I will give you an example from my account. I click on people who are following me and see that Lynn O’ConnellMeier is a CD for a digital firm. When I click on Lynn’s profile I see that she is based in Alexandria,VA and has 1,892 followers. This is a pretty good example of someone who is likely to be interested in my content so I follow her (and there is a pretty good chance she might follow back). Next I look at the people that are following her. There I am at the top because I have just followed her then I check out the next ones. The first one is offering cheap SEO articles – no thanks. The next one is a spammer – birthday freebies and look at the user name – no thanks. So we start skipping a bit quicker. We get to Kent Gustavson – Author, Ted Talk, Editor – yes, worth clicking follow. 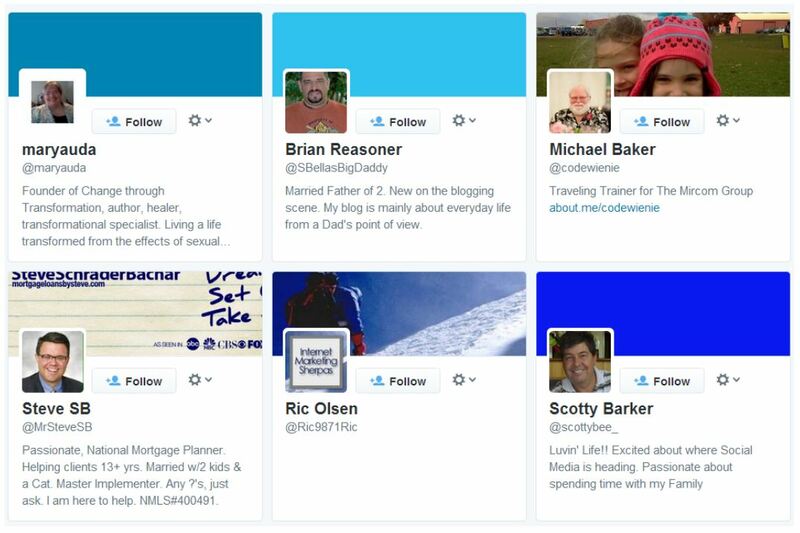 I would follow all of these except Ric who hasn’t bothered to complete a bio and who has no human profile photo. Don’t follow any that don’t have a profile pic or that have tweeted hundreds of thousands of times. Or any from “Follow You Follow Me” schemes or that offer followers for sale in their bio – all robots or spammers. Steer clear of most Russian language accounts as well as many of the worst Twitter spam seems to come from these robot accounts (sorry Russia). You can go down the rabbit hole by finding one of the people you have just followed and looking at who is following them and then you can do the same again… and again… and again. And you will be amazed by the people you come across and what they are about. 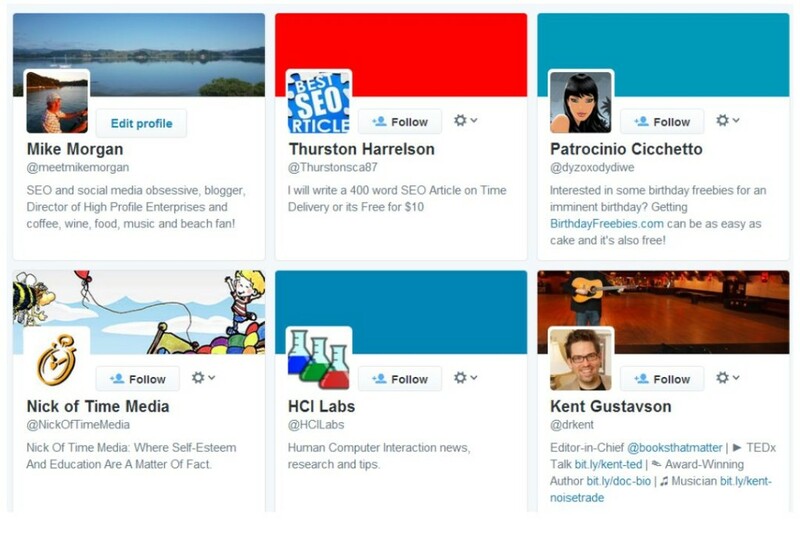 Make sure you are also following people who might be prospective clients as well. In my case it could be from a simple search like “NZ business tech” which will give people who have these words in their bio or who have tweeted with these words. I have quite a few choices here already – The people section under the Telcos has a number of people to choose from. Think about what people from your target market would be likely to have in their bios and search accordingly – be creative. You can follow a number of people every day – 25 – 50 is quite acceptable. After doing this for a couple of weeks you will find that you are following a lot more people than are following you back. This is where tools like Manage Flitter come in handy. If people are not following back they are not able to see what you are sharing and so are not ever going to build a relationship with you or benefit you in any way. They can’t share or engage with what they can’t see. 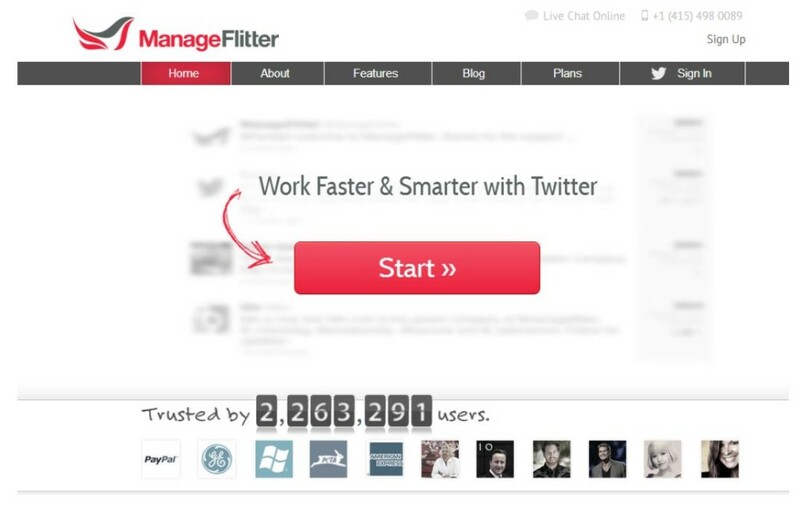 You can use Manage Flitter to unfollow inactive accounts, spam accounts and accounts that are not following you back. This evens your numbers up and allows you to continue to find new people to follow. Twitter has a limit on followers vs following and this will kick in at the 2,000 number if not before. Don’t push this following and unfollowing too hard as aggressive following and high churn will be picked up by Twitter and you could lose your account. Twitter is a brilliant way to make connections, to share content, to find great information and to demonstrate expertise. Make sure your profile looks great and says a lot about you. Always keep things polite and remember to thank people when they do something for you. Twitter is something that you should visit every day and you should not be averse to sharing content multiple times over a day. Try not to fall into the trap of using Twitter as a social telephone – many people tweet every few seconds in conversations with several people all day. You can imagine how much work they are getting through i.e. none! And it makes for a pretty boring feed. Post interesting content that relates to who you are, what you are interested in and what you do. Twitter also has a whole lot more in the way of functionality that I have not covered here – Lists, Hashtags, Influencer outreach, Direct messages, Photos and Videos, Vines, Apps, Follow Friday and much more. That can wait for the next installment. Enjoy Twitter – like me you may find it is the most valuable of all the social media sites. Next post How can your business create great website content? How can your business create great website content?